Despite their versatility in meals, you can't necessarily eat lentils in any form. Like other legumes such as beans, lentils are not eaten raw, unless they are sprouted first. You'll also gain the nutritional benefits by cooking mature lentils and eating them plain. In addition, lentils are a nutritional addition to soups, salads and vegetable stir-fries. 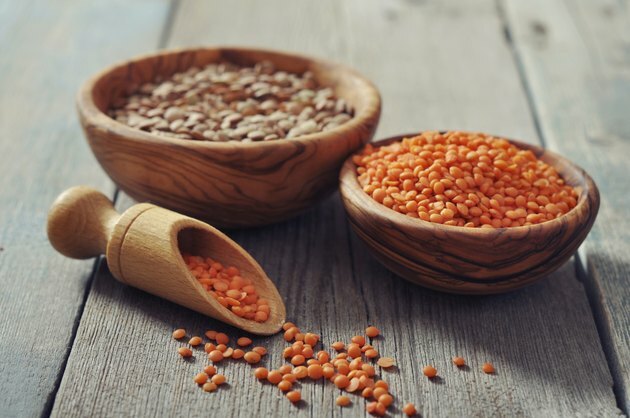 Lentils are best-known for their fiber and protein content, which the U.S. Department of Agriculture estimates at 16 grams and 18 grams, respectively, per 1-cup serving of boiled lentils. The same serving size also has an estimated 7 milligrams of iron and 731 milligrams of potassium, along with a total of 230 calories. Rinse off raw lentils before preparing them to get rid of dirt and other debris. Soak the lentils in water for seven hours and then let them sprout. According to "Vegetarian Times" magazine, the sprouting process can take two to three days. You do not have to soak the lentils before boiling. If you choose this method, the Academy of Nutrition and Dietetics recommends boiling for 15 to 30 minutes until desired tenderness is reached. Academy of Nutrition and Dietetics: How Do I Cook Lentils?